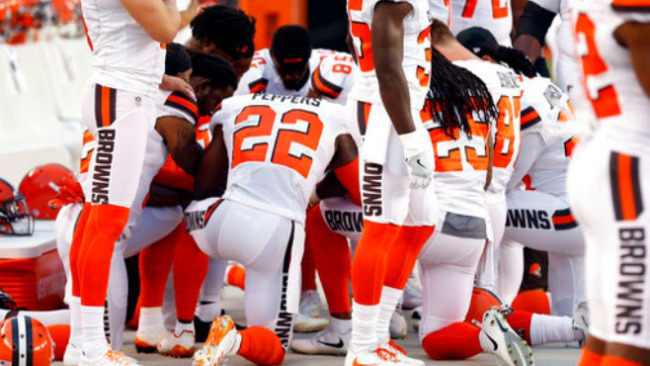 Members of the Cleveland Browns kneel during the national anthem before an NFL preseason football game between the New York Giants and the Cleveland Browns, Monday, Aug. 21, 2017, in Cleveland. President Donald Trump insisted Sunday that his opposition to NFL players kneeling during the national anthem to protest police brutality "has nothing to do with race" but has to do with "respect for our country and respect for our flag." Trump, who inflamed the sports world on Friday by saying players who protest police brutality during the Star Spangled Banner by refusing to stand or conducting other acts of defiance should be fired, reiterated Sunday that owners "should do something" about the protests. Trump, as he prepared to board Air Force One to return to Washington from New Jersey on Sunday, said he didn't think his comments Friday on players being fired or since have inflamed racial tensions. Trump said the players protesting the anthem were "very disrespectful to our country." "This has nothing to do with race. I've never said anything about race," Trump said. "This has nothing to do with race or anything else. This has to do with respect for our country and respect for our flag." Trump said he was not watching NFL games on Sunday — "Believe me, I'm doing other things," he said — but said he watched a little bit and "I will say there was tremendous solidarity for our flag and for our country." Following the president's comments on Friday, more than 100 NFL players sat, knelt or raised their fists in defiance during the national anthem on Sunday. Several NFL owners also condemned Trump's statement, including ally Robert Kraft, owner of the Super Bowl champion New England Patriots, who expressed "deep disappointment" with Trump. "I like Bob very much. He's my friend. He gave me a Super Bowl ring a month ago. So he's a good friend of mine and I want him to do what he wants to do," Trump said. "We have a great country. We have great people representing our country, especially our soldiers our first responders and they should be treated with respect."